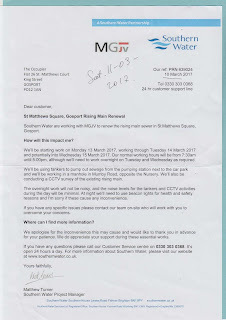 ( nr 371 ) - Saturday 11 March ( two days ago) a letter dated 10 March 2017 came into my postbox - see the scan. No sign so far of works, machinery, noise or beacon lights at night, as indicated in the letter for Monday 13, 14 and possibly Wed. 15 March. Note that the key word SEWAGE is missing from the Headline/Heading of the letter. "Rising Main Renewal" is obscure, but reminds one of The Rising Dump (film). Since I moved into flat 26, I often have on weekends a sore throat, dry mouth and and a white tong. "MosGas" ? Strange and illegally acting people (2) who came for an annual check of the (new) gas boiler in my kitchen, simply disappeared. No identification. Took away the triplicate (?) of last year test, dated January 27, 2016 with "To install CO meter" in the bottom line. 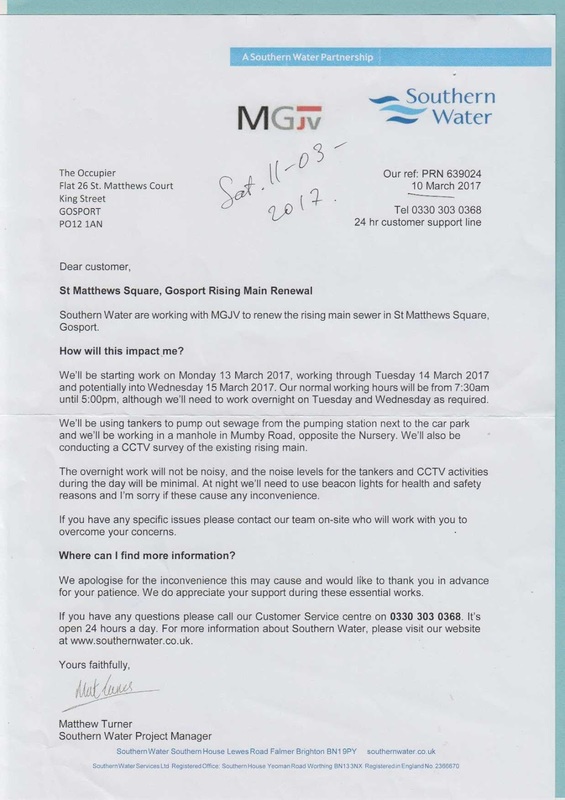 Did say they'd come the following week to install the CO meter, the day ( to be confirmed) they'd be coming to flat 60 in St. Matthews Court. The identity of my landlady is still a puzzle. I have not seen the two men who came "to check the gas boiler" before. [ Wed. 15 March, 2017] - Did all my neighbours get that strange letter? Was there a 'neighbourly chat' about it or expectation of ? I 'ran into' the man with his little boy from flat 29 upstairs a few times in the past couple of days. Poisonous fumes in the airplanes ( pilots' cabins) were reported to be the result of computer design errors. CAD - computer assisted/aided design. HASLAR in Gosport: former military hospital Haslar, from the times of CRIMEAN war (or earlier), has a tall Water Tower, with a separate water supply from SPAIN. Brian Hart, a retired engineer from Gosport, listed 'Haslar scandals' on his local election leaflet. (Can't read it from photocopy now ...). A woman bus driver of the E2 bus I took yesterday from Fareham to Gosport is ( according to my 'theory') part of what I call Irina+ network and in the same 'danger' category as Olga Patta. MARINES ( American ? ) were granted Freedom Charter ( by .... the Queen ? ) which allowed them to own/purchase LAND. I remember it was during Gosport Ferry scandals. I also remember (local history) that somehow land adjacent to a FERRY could or was to be purchased when ferry was bought or 'privatised'. Gosport Borough Council sold the Gosport Ferry. Haslar grounds are next to Gosport Ferry. Accents in Gosport is a special topic. German (!) shelves I bought in Liddle have serious design faults. Designed 'by computer' ? There were British reports about wash/drying machines going on fire. I heard yesterday that the machines use plastic (!) instead of metal. No wonder. [ Sat. 18 March, 2017] - Recent 'freak' or unexplained accident was reported in British media: a boy of about ten was killed when some 'stand' crashed on him in a supermarket or store. Where was that stand made and how was it installed/positioned? Just a detail from Polish (?) actors ( in the wake of diamond heist via plumbing ) on bus 3 or 4 from Fareham: the old man had a massive gold ring (high probe, lime rather than pink colour) and the stone was of dark violet, but not opaque colour. The MP for Fareham is Suella (or Luella?) FERNANDES with some Goa Portugese- Indian (?) roots. I have literally voiced (thinking aloud) the idea about missing refugees on board Gosport Ferry. Minutes later I had incorrectly reduced time on Gosport Library computer (which never happened before) thus telling me the idea may be more to the point, than I thought myself. They do over-react, one way or another, demonstrating how 'artificial' their intelligence is. In the post "Refugees gone missing ?" I mentioned e-mails (plus letters) to Russian and Israeli Ambassadors. I questioned identities and backgrounds of COHN family members. The two embassies acted " in concert " and did not answer. No reassurance ! Another thing about that family (?) is that David Cohn alleged his father (or grandfather ?) was a diplomat or ambassador (German). My Jewish 'friend' Lena (nee Lozhikova) told me they had relatives in Germany and received parcels (Red Cross?) from them. Lozh-Luzh ? She told me their original name was Loshakov and they changed it to Lozhikov. Olga PATTA sent her children for training to ISRAEL. Said it was "a great honour".